The skilful art of putting together the perfect ensemble. You may have had your ups and downs over the years, on what is appropriate dress code. You may have at times not behaved in such a daughterly fashion when she dared have an opinion on your creativity. However, let’s face it: Without mother’s guidance, fashion disasters would have been a much more significant feature in your teens and more than likely you would never have achieved the level of chic that you are at now. Relationship no-no’s. Remember when you hated mom and felt like you were never going to forgive her for RUINING your life? Ok, it was a while ago and there have most likely been many since. But, if you can cast your mind back to when your beloved boyfriend came complete with a bad record and the birth date that long expired your own. You will remember the frustration felt, when mom was incapable of recognising his charms and instead grounded you for a sentence that had him move on to the next unlucky victim (in the space of under a week). Leaving you momentarily heartbroken and eternally grateful for not being the depressed young single-mom that was to be the fate of your Successor. With tastes that evolve with time and experience you are now able to hold on to gorgeous, ambitious, professional: The perfect chic accessory! Bad education. Mom forced you to work, you wanted to play. Tantrums and vile rebellions should have driven you apart, but mom stuck by you and was there to support each fail and celebrate every achievement. With the battle won, your career prospects and future have paved the way to a life where inspiring environments, fabulous pastimes and stylish outfits are an actuality. 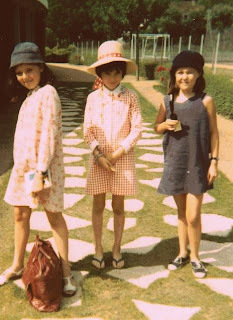 Celebrating mothers: An ode to my chic mother, stood in the middle posing with her cousins… Mother’s don’t get much more adorable (and chic) than this! Realistic for your budget (and time): Mom will not want you spending more cash than your budget allows. As for time, you organise a fab day with mom, you must ensure that you can get the time to carry this out. Be In tune with mom: Don’t blow your cash on something that you love but mom may only hold onto to make you happy. Different generations have different tastes! Consistent appreciation: You love mom and you always will. With birthdays, holidays and mother’s days being annual events, you should keep your chic treats realistic and evenly applied year in, year out. Go green: If mom thinks gifts look best in green. Get her something made from renewable or recycled materials. A hemp purse? With so many green treats available all over the place it is easy to treat mom to guilt free gifts. Culture Vulture: Bring mom up to the present and introduce her to the literary efforts of new authors, directors and musicians. Chic moms are open moms, so share your recent finds and get connected. Attention to detail: Next time your visiting mom, have a look around the house and see what mom loves, does she collect certain items? Are certain brands or themes reoccurring? Take these hints and use them as gift tips. Hobby horse: Does mom have passions outside of being a chic, fabulous role model? Maybe, mom loves gardening. If so, how about some stylish gardening gloves and a nourishing hand cream? Look into how mom spends her spare time and think of ways to inject added glamour and accessorize! very nice thought and a very good advise for girls. truly mothers are a great asset for all of us. Nice article, very impressive and thoughtful post for young children to read for. Very thoughtful.. I need to pass it on to my daughters! Great blog! very thoughtful for all kids! Thanks for sharing! Thanks ladies! So happy you like it, try and sneek it past your daughters! Mothers are the "makers of life". Very sensible blog post and i really thought of my mother while reading this post. Gr8 way to express the feelings buddy.